Primary Location: First Saw: In Theatre Saw at/with: Showcase North Haven? Mine: Well plotted and terrific. The entire cast does a really good job. Hanks stands out. 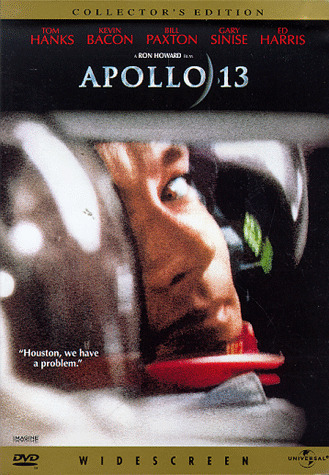 Leonard Maltin/Plot synopsis: Exhilarating story of ill-fated Apollo 13 moon mission, and how the heroic work of astronaut Jim Lovell and his crew, combined with the dogged persistence of the NASA team in Houston, averted tragedy. A rare instance where special effects actually serve the story and help make it completely credible; perfect 1970s period detail is another asset. Screenplay by William Broyles, Jr. , and Al Reinert, from the book Lost Moon by Lovell and Jeffrey Kluger. Director Howard's brother Clint has a good role as one of the Houston eggheads; father, Rance, plays a priest; and mother, Jean, is a treat as Jim Lovell's mom. The real Lovell appears as an officer on the aircraft carrier in the final sequence. Winner of Oscars for Film Editing and Sound. Super 35.